Preaching on John 3:16 tends to fall into two categories: 1) insipid, usually because it has a definition of love completely contrary to the passage or 2) counter-productive because it proclaims what is cheap grace. It proclaim the truth of Christ without asking that we receive him and live by the Spirit. 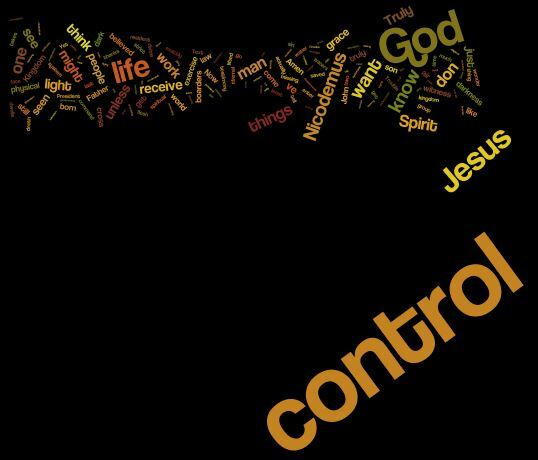 We have no problem with Jesus, so long as we have control over him. The problem with that is that the Father has chosen Jesus. Verse 17, we are saved through him. And in the context of Nicodemus’ midnight visit Jesus has chosen to act in a specific way – by water, Spirit and cross. Believing in Jesus is not just a simple matter of intellectual assent. Believing in Jesus is in part an admission that we are not “in control”. The Spirit which dwells within us from our Baptism is our guide. And that Spirit leads in the path of the cross following Jesus. Grace is a gift, we can only receive it or turn it down. We can accept Jesus, or stumble around in the dark with Nicodemus. This entry was posted in John, Lent, podcast, Sermons and tagged confronting our desire for control, cross, grace, Jesus is The Way, John 3, John 3:1-17. Bookmark the permalink.